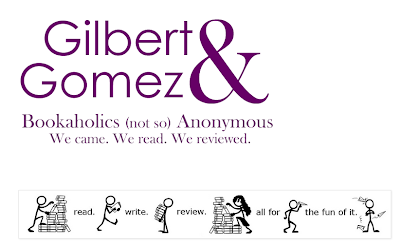 The above is the heading for a new blog called Gilbert & Gomez. It is the brainchild of Enjoli Gilbert who is the president of the Patrick Taylor library book group, Bookmarked, and Hayley Gomez, who has been a faithful member of Bookmarked since it was established when she was a freshman. Both students are friends and graduating in May. (I am really going to miss them both next year). They have been avid readers in the YALSA YA Galley program. They have been talking for months about creating a medium on-line where they can gab about the wonderful books that they are reading. I am so amazed by what they finally created. They give some great insight into their thoughts on the books--their reviews are so much better than what I would write. If you like young adult literature, or just want to see what two teenagers can accomplish when they put their minds to it, check out the Gilbert and Gomez blog: http://gilbertandgomez.blogspot.com/.